Elaine has come up with a detailed traditional hands-on quilt project with a modern twist! This four month project has six different twelve inch traditional quilt blocks. 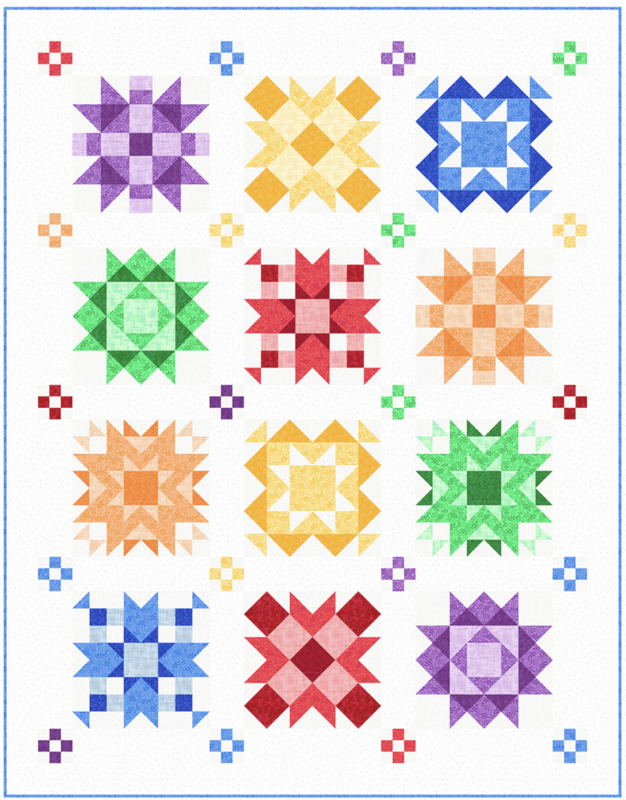 This quilt uses six color ways with three shades of each hue to create a stunning quilt. There is an optional Kit available for $165.00. It includes the pattern and 21 different fabrics for the quilt top and must be preordered. If you want to create your own palette arrange an appointment with Elaine or Laurie. The finished size of the quilt 54" x 69." Materials List Fabric: Fabric Kit: must be order by May 1st. $165.00 includes pattern. Choosing your own fabrics must be purchased before first class* Pattern $12.00 Backing Fabric: 3 1/2 yards Supplies: Sewing Machine Rotary Cutter and small mat Quilt In a Day Square Up Ruler Ruler 6" x 12" Frixion Pen Basic sewing supplies: pins, thread, seam ripper, small scissors. Homework: Fabrics will need to be cut Before Class!!! I recommend starching and pressing fabrics before cutting. You will get cutting directions before first class. ?There are a minimum of 20 fabrics and if you choose to do your own thing Elaine or Laurie will help just call and arrange a time.